One of the things that I truly enjoy about Andrew's challenges is how they push me to work with colors I normally tend to avoid. This time around, it's the color yellow that I usually run screaming from. But just look at all those great beads and I can't resist a challenge. I was expecting a challenge and I certainly got one. I ended up taking this necklace apart a few times before I was satisfied with it. Thank goodness this hop kept getting pushed back. I am still not a 100% pleased but I can't tell if much of that is color itself though. I did just love the mystery component that Andrew sent out and I wanted to make sure that it was front and center. I did succeed there. Now I am really looking forward to see what all the rest of the very talented designers did with this kit that was such a trial for me. And no I am not complaining. I knew that this would be a stretch for me. Hi Shai, I like it and I am not a yellow person either. I like it, and I am a yellow person! I really liked Andrew's mystery component, and it looks lovely here. I like how you worked so many different tones into the necklace. I'm a yellow person too and I love it, I love the chunkiness and the lovely gradation in yellows. I too am terrified of yellow. I think you did an amazing job! Shai, I think it's perfect! You highlighted the different shades and tones of yellows and golds and it accentuated Andrew's pendant perfectly! You might have struggled but you have a beautiful necklace. I too was challenged with the color. I didn't see the Yellow I was more focused on tan and browns which are always a challenge for me, lol. Your Challenge turned out quite nicely, the Necklace is Lovely. 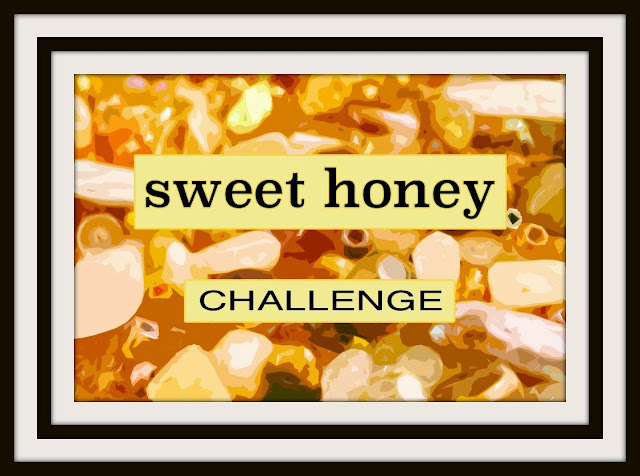 You met this challenge head on, the Necklace is Lovely. Yellow is a VERY difficult color for me - this necklace is gorgeous! It is the various tones of yellow and orange that make it so special - love it! I think sometimes it's the true challenges that make us grow as designers. Sometimes things fall into place magically, but usually it takes a lot of work leading up to those magic moments. When we struggle, it's not necessarily a bad thing. It's just another step in the path. I think this necklace is quite lovely. 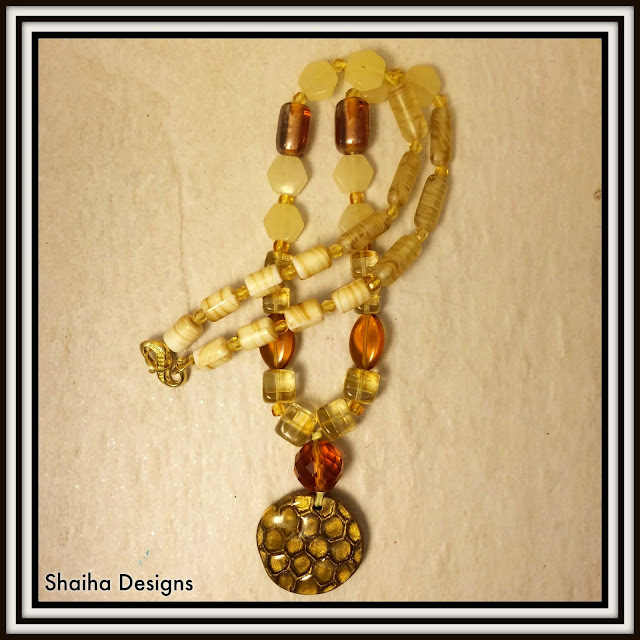 I like the addition of the lighter toned beads and the way you've built a rhythm with the pattern of your beads... all leading up to the big faceted vintage Czech glass round which draws the eye to the pendant. Plus those hexagon beads match the pendant perfectly! I think you did a great job! Thanks again for participating!